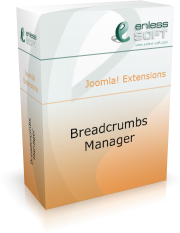 Breadcrumbs Manager features a very flexible pattern model. The breadcrumbs are defined by patterns. Each pattern contains one or more breadcrumbs items. The definition of breadcrumbs items is very flexible. There are some predefined Joomla-related items and you could define your own items using text, SQL queries or PHP script. It is also possible to create your own sets of items by writing a plug-in. The pattern model has two types of patterns – Global and Special. Global patterns are ordered and the first appropriate pattern is used when displaying a page. Special patterns are bound to specific places of the web site. You can define default starting/ending items for the breadcrumbs in your web site. These items are displayed regardless of the currently active pattern. It is possible to define static breadcrumbs items. These items are inserted in any pattern in a user-defined position (index). It is possible to define activation conditions for a static item which makes the feature quite flexible. Example: you could append an item “Products” which links to your main “Products” page when the currently displayed article is from the “Products” section.